Arms' role is not just for work and movements, but also, with their beautiful contours and shapes, as symbols of one's beautiful body - admired when naked or when wearing a certain style of dress. Oftentimes, dramatic weight loss, age-related changes in the skin and muscles that have lost their elasticity and tone, or conversely, being overweight, lead to sagging shoulder skin. At times this leads to severe deformation or asymmetry. For many women, wearing dresses that reveal arms becomes impossible. This problem is solved through brachioplasty. An arm lift, also known as brachioplasty, is a surgical procedure to remove loose skin and excess fat deposits in the upper arm. With age, upper arm skin can become loose and flabby. 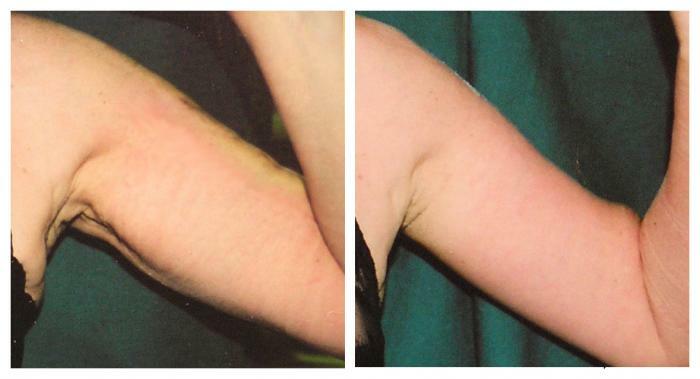 Plastic surgeons will discuss brachioplasty with patients who want to tighten this skin and look as good as they feel. In some cases the plastic surgeon may suggest that liposuction be used alone or in conjunction with an arm lift to remove excess fat in the upper arms. 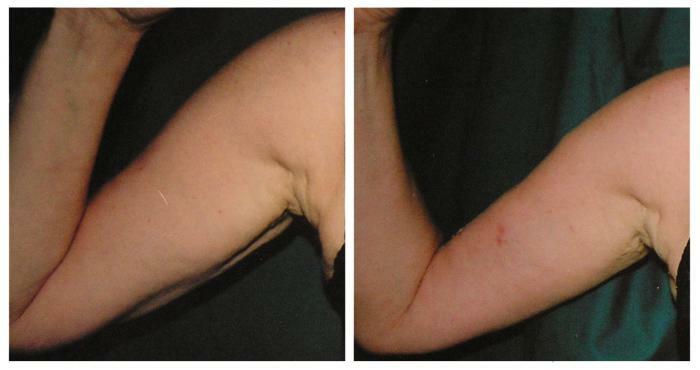 Arm lift is performed primarily through excision of excess sagging skin or liposuction of fat tissue. Depending on each individual case, it is possible to combine these two techniques. These operations are suitable for both women and men. Anaesthesia: local anaesthetic combined with intravenous neuroleptoanalgesia. The patient is sent home 2 hours after the operation. Sutures are removed 10-12 days later. Dynamic observation once a week for 6 months. Ability to return for work 10-12 days later. Price: The pricing for this operation is determined during the consultation. The surgeon will investigate the degree of arms' deformity, their asymmetry, muscle tone, the nature of skin and subcutaneous fat. Based on these the surgeon will decide on an individually tailored method and techniques of surgery. The size of the post-operative garments will also be decided. For improved blood circulation and rapid healing, the patient needs to quit smoking 2 months prior to the surgery. The patient should be warned that the effect of this operation are "long" scars that stretch until armpits. Therefore it is important that a correct and accurate suturing technique in employed by a plastic surgeon who has extensive skills and experience. Brachioplasty is conducted in the area of vital arteries and nerves. It should, therefore, be carried out by an experienced plastic surgeon.